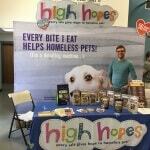 So you already know we’re helping homeless pets. But you may be wondering what’s in it for my dog? 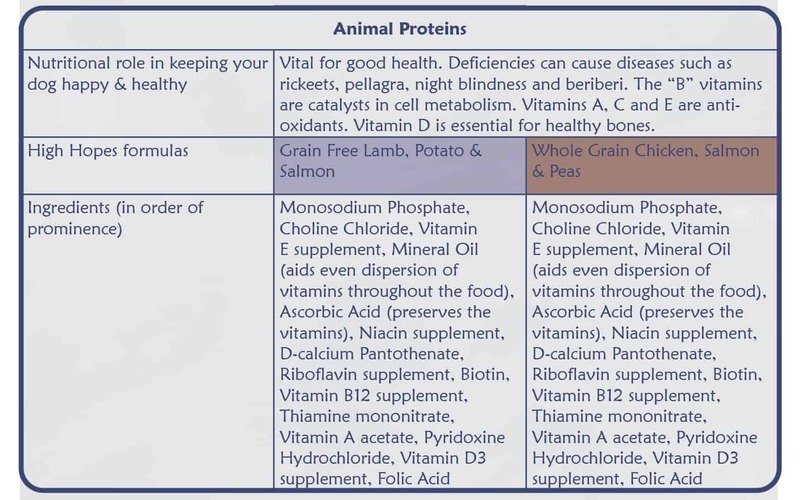 Protein mostly from animal sources (65 – 70%). Variety of fruits, vegetables and legumes. Rich & balanced proportions of Omega-3 & 6 (including DHA & EPA) and phytonutrients. Natural sources of chondroitin & glucosamine. Small batch made in the USA at an experienced, family-owned, super-premium facility. 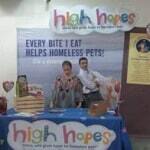 Developed by a recognized pet nutritionist who has a PhD. in Animal Nutrition. 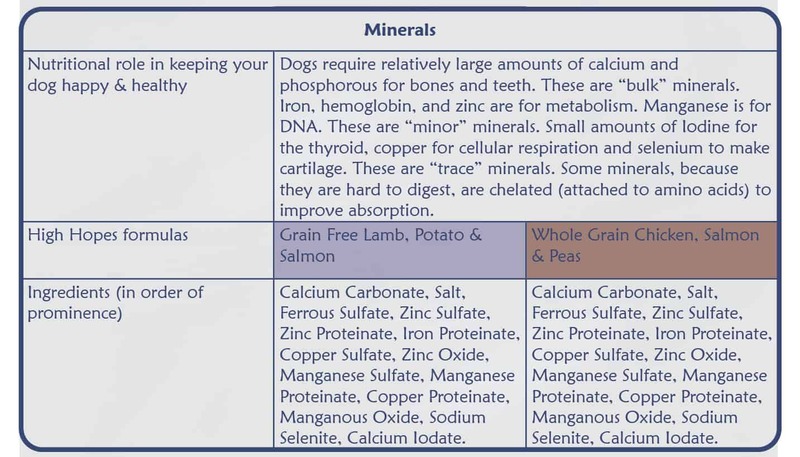 Here’s an explanation of our ingredients and how they contribute to a nutritious food for your dog. We grouped them together so it makes sense. Highly digestible proteins such as Lamb, Salmon, Chicken, Egg etc. provide sources of indispensable amino acids and essential fatty acids needed for metabolism and to support your dog’s muscle and immune system. 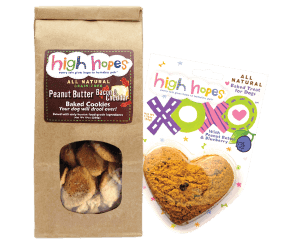 High Hopes® diets include a variety of proteins for balance. Click here for more detail on the animal ingredients included in our foods. Fats like fish oil, flax seed and chicken fat provide a balanced blend of Omega-3 and 6. These fats and oils keep your dog’s skin and coat healthy. 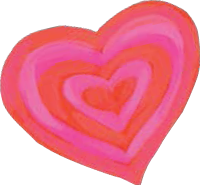 They also help protect the heart and kidneys and reduce inflammation. Especially in younger dogs, they enhance neural and retinal development. Click here for more detail on the fat and oil ingredients included in our foods. Garbanzo bean and peas are sources of protein and fiber, and are relatively rich in indispensable amino acids. Legume fibers are prebiotics and help maintain good stool quality (a relief to us pet parents too ). Legumes starches are also digested more slowly for sustained energy. The combination of slowly digestible starches like legumes, with faster digestible starches (see tubers below) helps give your dog the energy he needs, while avoiding the peaks and valleys of glucose release. Click here for more detail on the legume ingredients included in our foods. Ingredients like potato, tapioca and sweet potato bring multiple benefits. They have fiber and vitamins (i.e. beta carotene and vitamin B6), and also give the food a crunchy texture dogs like. A little crunch can also help keep teeth clean. Click here for more detail on the tuber ingredients included in our foods. Oats, barley, brown rice are good sources of fiber and vitamins (and in us humans, are part of a “healthy heart” diet). The starches are more slowly digested, and as a result, provide balance to the more quickly digested potatoes and tapioca starches. Click here for more detail on the whole grain ingredients included in our foods. A rich blend of fruits and vegetables (see our blog on the power of fruits and vegetables in your dog’s diet) provide multiple phyto-nutrients. These nutrients can help reduce inflammation, aid digestion, help maintain and control blood pressure, as well as reduce the risk of heart disease. Click here for more detail on the fruit and vegetables included in our foods. Ingredients such as Fish, fish oil, flaxseed, help reduce inflammation, protect heart and kidney functions, and may help improve retinal and neural development, especially in younger dogs. Chicken cartilage and chicken meal are natural sources of glucosamine and chondroitin for hip and joint protection. Click here for more detail on the functional ingredients included in our foods. Essential for normal growth and survival, chicken, chicken fat, fish, fish oil and salmon all help protect skin, which is the body’s largest organ, from dehydration, toxic substances and infection. May help reduce inflammation including some skin and osteo-arthritis symptoms; help protect heart & kidney functions; and studies have reported findings of improved neural development and retinal development – especially in younger dogs. Click here for more detail on the essential fatty acids included in our foods. Your dog can’t synthesize these, so they need to be in their food. Amino acids are the building blocks of proteins and central cogs of metabolism – without them, cells break down and serious diseases occur. Click here for more detail on the indispensable amino acids included in our foods. Vitamins are vital for good health. Vitamin deficiencies cause diseases such as rickets, pellagra, night blindness and beriberi. The “B” vitamins are catalysts in cell metabolism. Vitamins A, C and E are anti-oxidants. Vitamin D is essential for healthy bones. And most importantly, your dog needs just the right balance to stay both happy & healthy. Click here for more detail on vitamins included in our foods. Dogs need relatively large amounts of calcium and phosphorus for bones and teeth. These are “bulk” minerals. 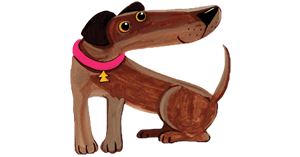 Dogs need iron for hemoglobin, zinc for metabolism and manganese for DNA. These are “minor” minerals. Lastly, dogs need small amounts of iodine for the thyroid gland, copper for cellular respiration and selenium to make cartilage. These are “trace” minerals. Some minerals are harder to digest, so we use more expensive, chelated minerals (attached to amino acids) to improve absorption. Click here for more detail on minerals included in our foods. Taurine has been used in cat foods for many years, but recent research suggests that even some dog breeds/mixes (Newfoundland, spaniel, retriever) may not always be able to synthesize enough. A lack of Taurine can cause eye and heart disease. Only natural preservatives used here! Click here for more detail on the natural preservatives included in our foods. More questions on pet nutrition? Click here to ask our Pet Nutritionist.